As I mentioned previously, I have been reading a book on programming called "Dreaming in Code" (by S. Rosenberg, full ref may be found below). Seeing as I've just finished it now, I thought I would share a few brief thoughts on it. In all, I enjoyed reading it. It wasn't what I was expecting, and I read it relatively slowly, over the past month, reading a half-to-full chapter at a time. In all, whilst it is about programming, with a particular emphasis on large projects/programmes, it covers history, basic software engineering concepts, and the story of a single open-source development project in a mixed-up sort of way, but a way which still managed to keep my attention (i.e. I didn't have to expend too much effort in picking the book back up after leaving it for a few days). In going through the development (evolution is perhaps a better word) of an open-source software project - a PIM called Chandler - a number of general software development issues are come across and discussed in the context of historical software engineering developments. This is what I particularly liked about it - the central story of a particular software development project, with the deeper consideration and historical context for some of the central features of its ongoing work, both technical, and personal. And this is what seems to persistently emerge as a fundamental confounding factor of software development: the computer is as precise as could be wished for, but those telling it what to do are decidedly not so (an observation so familiar to anyone who has written, or attempted to write, any piece of code). Having said this, unlike some other reviews, I found the chapter dedicated to methods (chapter 9) to be a bit too contrived and preachy - particularly given the easy-going style of the rest of the book. This isn't to say the subject matter is out of place: it goes through . I think it's no coincidence that this chapter seems to depart furthest from the Chandler story narrative, a form that suited the rest of the book so well. I suppose it depends on your perspective: I enjoyed the Chandler story, with it providing the context for delves into general software engineering principles and history, so when this context fell away in chapter 9, I was left missing it. So, would I recommend reading this? I think it depends (which is a cop-out of course...). I'm technically minded, I write code regularly, but I'm not a software engineer, and I've had no real prior knowledge of how big software projects are run. As such, the book provides a little glimpse of this. I think that while it would be too much to say that this book provides a full coverage of software development techniques by means of little examples, it does provide enough that I learned something from it. If, however, you have already been embedded within a formal software development setting, then I don't think you will gain anything new by reading this - apart from confirmation that software development (closed-, open- source of otherwise) is hard work, with many pitfalls, and having more money to do something actually seems to make it even more difficult. This of course could be reason enough though! For me though, I enjoyed reading the book, for the little asides to the main story as much as anything. However, what is obviously minimally required is some form of interest in the way computers are cajoled to do our (collective) bidding. It seems as though since the book was written, Chandler has fallen to the very criticisms that the book makes of closed-source, commercial software developments: closed development, lack of user testing, and changing specifications (among others). However, despite the departure of the books seemingly main protagonist, Mitch Kapor, Chandler does seem to still be going, with the 1.0 release the focus of so much discussion in the book, but with not too much activity (e.g. planning pages on project wiki last updated in 2008, and project blog not updated since 2009...). 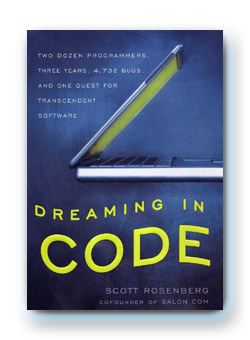 Scott Rosenberg (2007), "Dreaming in Code", Crown Publishing, ISBN: 978-1400082469. Website accompanying the book is here. The story on the BBC News website that the world's smallest frog has been discovered. Really? Wow! Smallest frog? Picture from the BBC News story. In an attempt to return to the original goals of artificial intelligence and cognitive science, this special track invites papers in human-level intelligence, integrated intelligent systems, cognitive architectures, situated embodied cognition, and related areas that aim to explain intelligence in computational terms and reproduce a range of human cognitive abilities in computational artifacts. The track will focus on various cognitive capabilities in the context of artificial cognitive systems, including the following, as well as other related integrated cognitive functions. There are a number of other special tracks too, in addition to the main technical programme, among which are the intriguingly titled "computational sustainability and artificial intelligence", and more conventional "robotics". In any case, the deadline for submissions is not far off: January 20th 2012. I don't use MATLAB very much at the moment, or even in recent years. Production of a couple of graphs perhaps, maybe a little data processing, but nothing that can't really be done using any other piece of software available to me (MS Excel, LO Calc, or a bit of my own code). I have used MATLAB extensively in the past, mostly Simulink though, for some signal processing and control stuff, so know it can be a very useful tool. However, given my current MATLAB inactivity, and that where I work doesn't have an endless supply of licenses for research (and these are fairly expensive as you may have noticed...), it seems that my occasional use can be easily covered by the open-source/freeware. The main options seem to be Octave and SciLab. Both are open-source and free, and can be used in Linux, Windows or MacOS (I like cross-platform compatibility...). As open-source 'versions' of MATLAB, both of have at least some degree of compatibility with it. Although there seems to be some disagreement on which is closest to full MATLAB compatibility, from what I've read while only briefly looking a little further into it, Octave tries to maintain the same syntax (so aiming for m-file compatibility, and treating any deviations from this as bugs), whereas SciLab offers a tool for conversion. I think that a similarity to MATLAB in terms of functionality and syntax is beneficial because of its pervasive nature, and the subsequent opportunity to share resources. In terms of a comparison between these two in a more computationally technical sense (comparison of calculations, plotting and syntax with MATLAB), see this tech report, which also mentions another possible candidate too - FreeMat. This report concludes that Octave does actually offer a viable alternative to MATLAB, with limitations found in both SciLab and FreeMat. Why did I write a post on this? Mostly just because I want a record of these links for myself, but partly because hopefully someone else will find this useful too.